For the second straight season, Punch-Drunk Wolves attended a Timberwolves road game. Last year was easy: Pat lived in Washington D.C., where — you know — an NBA team plays. He moved to Pittsburgh in the off-season. 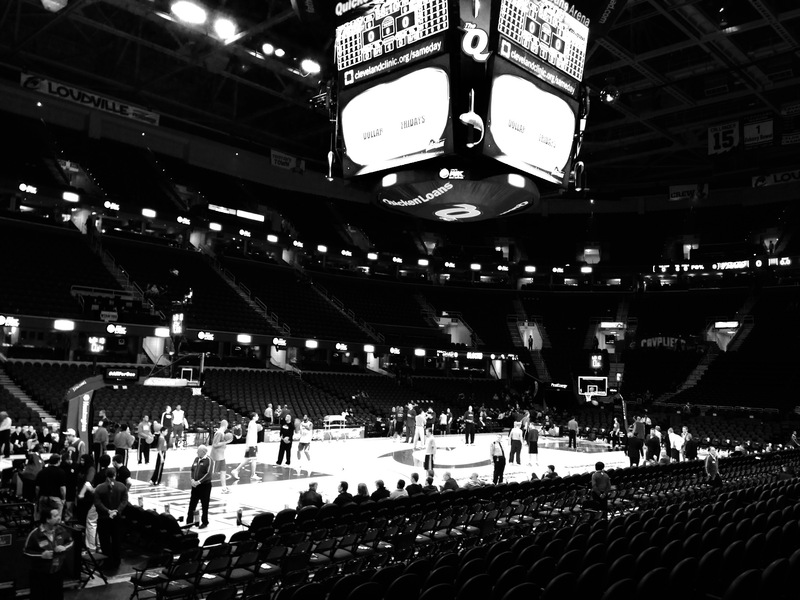 While The Steel City has no professional basketball, it’s just a two-hour drive from Cleveland, where the Cavaliers play. Since we’re both outspoken fans of Kyrie Lee Irving, and predraft boosters of Anthony Bennett, it seemed only logical to plan a trip to see the Wolves play the Cavs at Quicken Loans Arena. The following is a collection of photos I snapped of the journey. 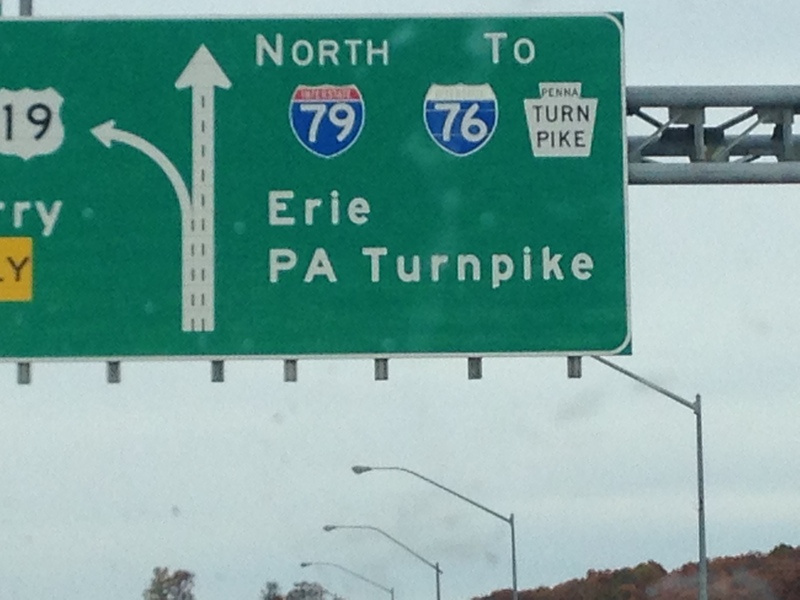 If you’re wondering why the first photo is a highway sign to Erie, Pennsylvania, then you clearly missed the biggest basketball story of the weekend. That’s right, former Timberwolf forward and legendary champagner-and-campaigner, Tyree Ricardo Davis, is back in basketball. He was drafted 93rd overall by the Erie Bayhawks where he will join forces with preps-to-(Israeli) pros disappointment, Jeremy Tyler, in trying to resurrect a career that most thought was gone for good. For Tyler’s sake, I hope Buckets employs different mentoring methods from what Anthony Mason and company provided him as a youngster in Charlotte. In any event, a future trip to Erie seems like something that a lot of people should already be planning. Speaking of champagning and campaigning, we needed to do some of our own, to break up the long drive. By champagning and campaigning, I guess I just mean we needed lunch. 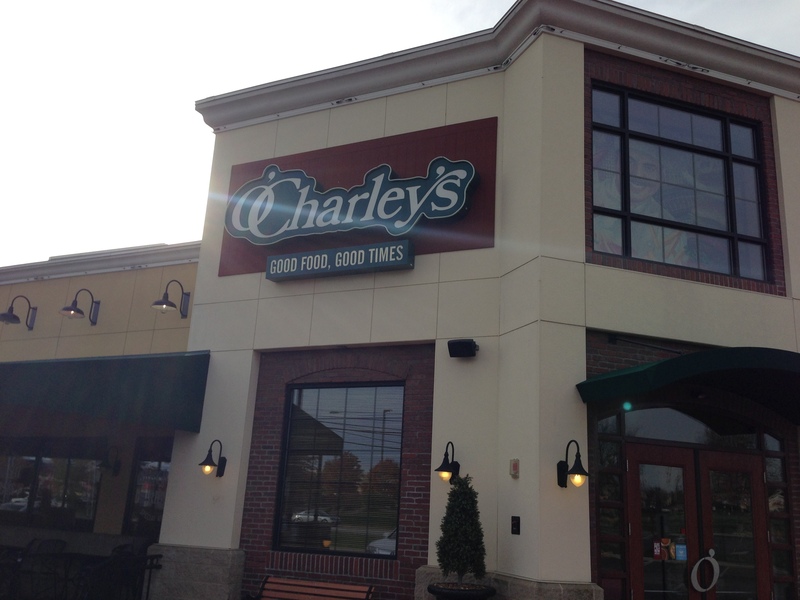 In the Greater Youngstown Ohio area, Yelp seemed to prefer O’Charley’s to Applebee’s. It got the job done. We arrived in Cleveland with time to spare. Our 4:00 trip to the will call window was unsuccessful. The Q has a thing where they swipe the card you paid with right at the gate, and hand you freshly printed tickets. The town seemed really quiet, at least compared to Minneapolis. Very easy driving into the city, and very few people walking around the arena neighborhood. Happy hour rates at City Tap were honored on a game day, which was cool. Gates opened at 5:30. We showed up at about twenty after, which allowed a few minutes to check out the lobby. 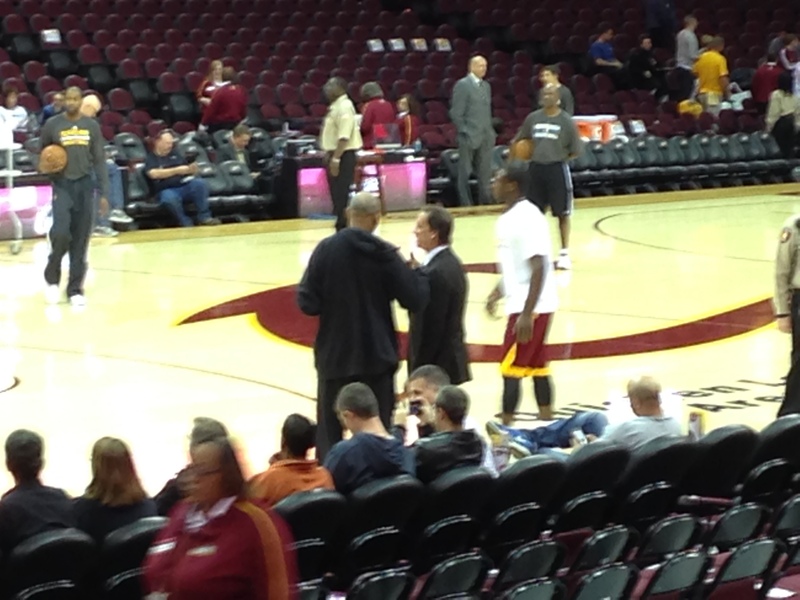 There are your Cleveland Cavaliers logos. Which is your favorite? 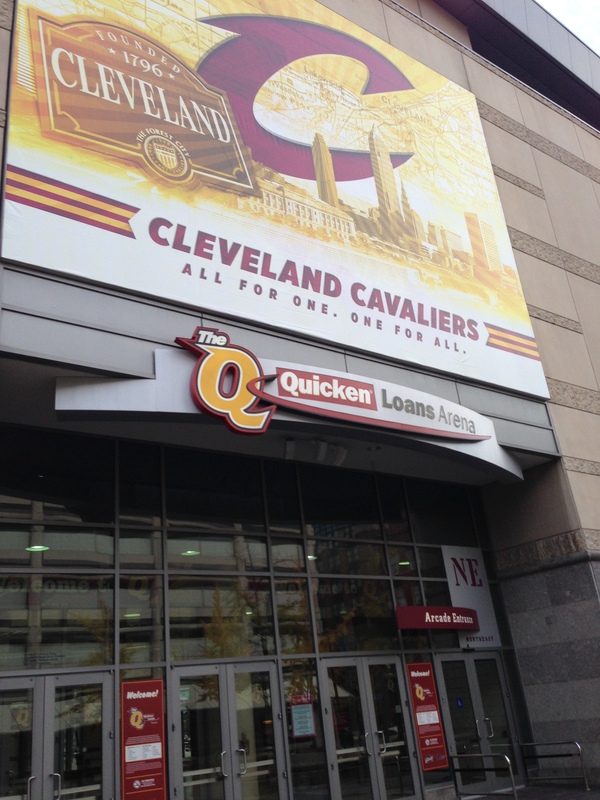 You’ll notice above the gates a photo collage that spans Cavaliers history. 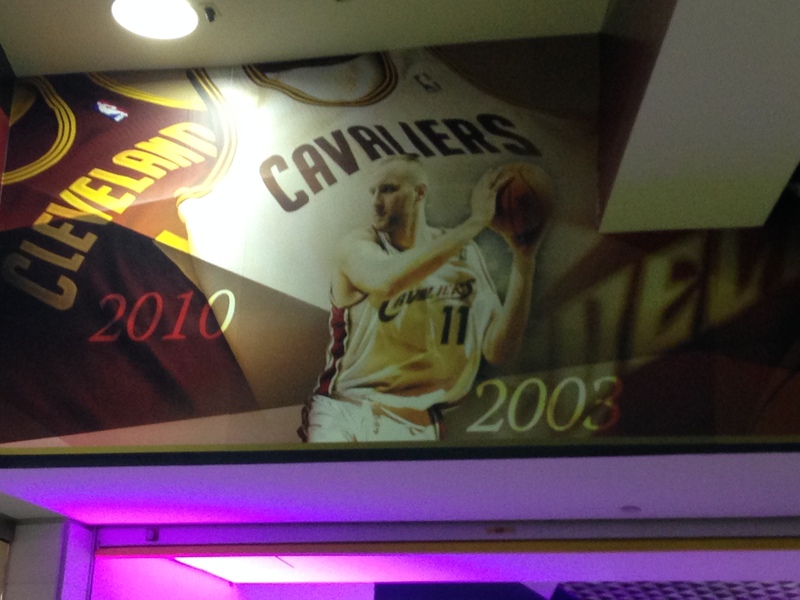 Because nothing says Cavs 2003-10 like Big Z in the post! There were quite a few Zydrunas Ilgauskas jerseys in the crowd, and Big Z himself walked through the tunnel near our seats. He waved at the soda salesman in our section. It was easy to get the impression that he’s a beloved Cleveland sports figure. Still, there’s such an appreciable Lack of LeBron pervading that building. Nobody wears his jersey. (Unlike Minnesota, where Garnett jerseys have remained popular game-night apparel from the moment he left for Boston through the present and continuing.) Spending one night at Quicken is enough to make me second guess the ideas floating about his possible return to Cleveland when he becomes a free agent next summer. @AschNBA @ClayFischer got to get some stops Lexi has to compete vs CJ Millea. We need bench production. If I thought Rick Adelman knew what Twitter was, I’d be worried that the coach wouldn’t like his GM tweeting about his players during games. Either way, he’s gotta get that spell checker fixed. I couldn’t manage to keep the names from flashing out of the picture. 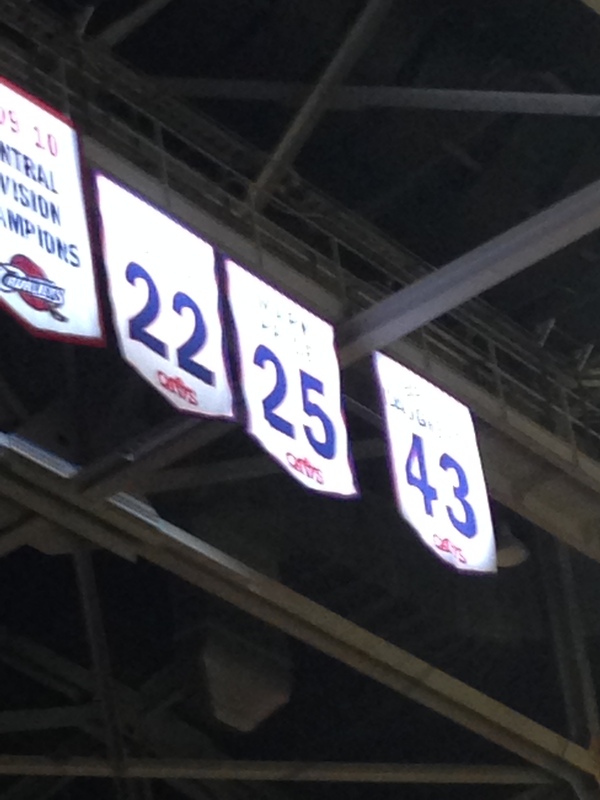 Those are the jerseys of Larry Nance, Mark Price, and Brad Daugherty. If LeBron is lucky, maybe his 23 will join them one day. Former teammates Alexey Shved and Sergey Karasev took a break from warmups to catch up. Neither made a positive impact on the game. Karasev had the excuse that he didn’t get to play. 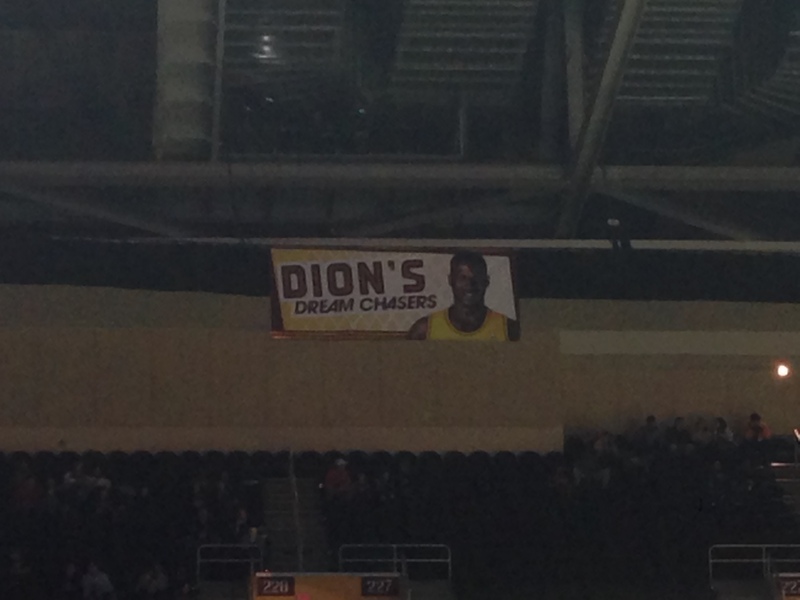 In case you’re a big Dion Waiters fan and in need of a good fantasy hoops team name. Anyway, as I’m sure you know by now, the Wolves played like crap for three and a half quarters before nearly pulling off a remarkable comeback. The effort fell just short when Kevin Love’s would’ve-been-game-winner barely missed off the rim. The trip was a blast, but seeing as how the Wolves are 0-2 (versus Washington and Cleveland, no less) on these Punch-Drunk tours, perhaps we need to rethink the strategy. Warriors come to Target Center tomorrow night for what will certainly be a tough test. Too bad your guys (Irving and Bennett) didn’t do anything noteworthy in your honor. 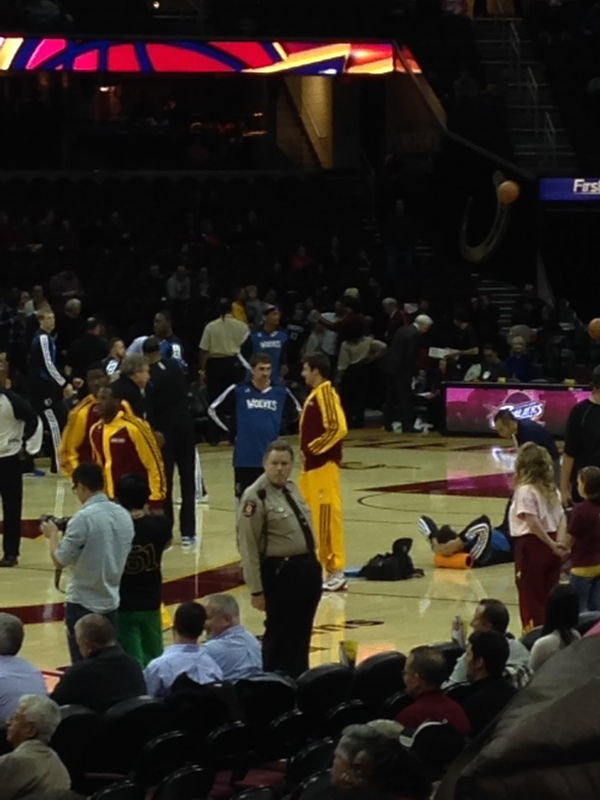 Irving was bizarrely barely noticeable in this game. Weird. Please use whatever pull you have to berate Flip for his embarassing tweets…Also, thanks for the photos. I like that Flip is on Twitter, I just wish he had a proofreader on his staff. You get some insight into how he’s interpreting things in a way that isn’t filtered through interview questions, canned pressers, etc, which I think adds value from a fan knowledge perspective. Does anyone else wish that David Kahn had had an active Twitter account while he was POBO?